CRAVE American Kitchen & Sushi is proud to be a part of one of the Twin Cities’ hottest destinations. Whether you’re taking a break from shopping, grabbing a bite before a Summer Blockbuster, or celebrating a special occasion, CRAVE is the perfect option for you. Enjoy the sunshine on our outdoor patio, celebrate in style in one of our Private Dining Rooms, or take a seat at our Grand Sushi Bar to watch as your meal is prepared before your eyes. 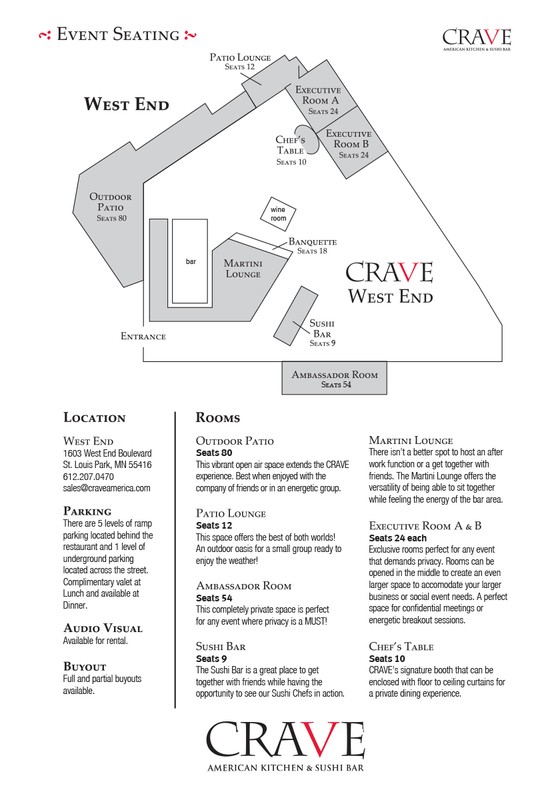 Book CRAVE – Shops at West End For Your Event Today!